Researchers at INSP have been investigating the propagation of magnetic domain- walls, a physical phenomenon that could enable the development of new memory and logic devices. Working in close collaboration with a theoretician from the University of Riga (Latvia) and using a combination of numerical simulations and a semi-analytical approach, they have explained the appearance of high domain- wall velocities that are observed experimentally. These can be attributed to the excitation of the fl exural modes of the domain-wall. Ferromagnetic materials are used to store information because their magnetic domains, oriented ‘north’ or ‘south’ can easily encode ‘0’ or ‘1’ bits. It has been suggested that this information could be manipulated by acting directly on the wall separating two domains ; since the wall is a complex interface that can be put into motion by a magnetic or an electric fi eld. Already in the 1970s, numerous studies revolved around bubble memories, which were based on the propagation of circular magnetic domains. These were even marketed for non-volatile information storage. But their comparatively high price and slow speeds eventually led to their defeat by the blooming semi-conductor based storage technologies (e.g fl ash) at the end of the 1980s. However, they have been the object. a) A magnetic domain-wall separates North and South magnetized areas. Its structure contains several degrees of freedom all of which can oscillate in time when a magnetic fi eld is applied. b) Movie of the layer’s cross-section with a propagating domain-wall. The colors (red/blue) indicate the components of the magnetization perpendicular to the plane of the image (A. Thiaville, LPS Orsay). These new ideas have led to a surge in theoretical studies, with people generally applying a simple model to describe the propagation of domain-walls under an applied fi eld. Although broadly used, it renders only approximately the experimental curves, and in particular does not reproduce the velocity peaking found at certain fi eld values, a feature that could be of potential interest for applications. 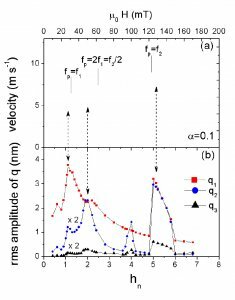 Using micromagnetic simulations, the researchers from the INSP team, in collaboration with colleagues from the LPS (Orsay), have understood the conditions leading to the appearance of these velocity peaks. In the fi eld regime they have considered, the domain-wall moves along with the magnetization within its core whirling around (like Taz, the Tasmanian Devil) at a frequency proportional to the applied fi eld. Concurrently, the domain-wall undergoes a periodic bending, almost giving the impression that it is dancing the tango in order to move forward (see movie in Fig. 1). It is when the swirl frequency becomes equal to the eigenfrequency of the fl exing domain-wall that a velocity peak very clearly appears. 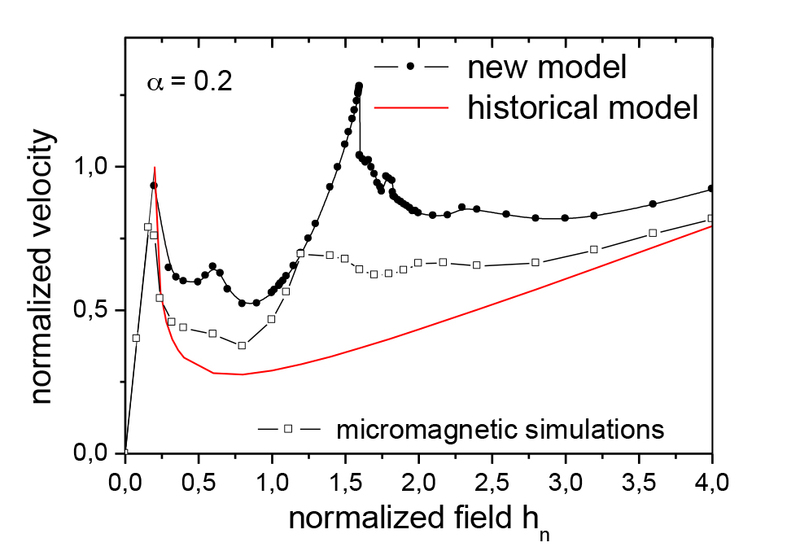 Numerical simulations have moreover shown that this eigenfrequency can be tuned through the thickness of the magnetic layer, as observed experimentally. This is very much analogous to the tuning of a vibrating string’s eigenfrequency through its length. Domain-wall velocity versus applied fi eld : the historical model evidences two regimes separated by a single sharp peak. 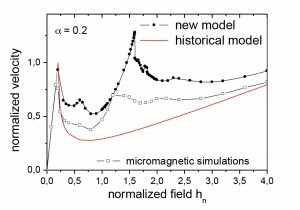 At high fi elds, the v(H) slope is constant, unlike the wide peak appearing in the micromagnetic simulations. The latter can be reproduced by a semi-analytical model taking into account the different fl exural modes of the domain-wall. Analyzing the simulations moreover put to light the presence of sub-harmonic frequencies in the domain- wall’s position spectrum, a signature of the non-linear nature of this oscillator. This phenomenon is common to many areas of physics : optics, point mechanics or electronics, and in parametric oscillators where the restoring force varies periodically with time. In the present case, this restoring force is internal : it stems from the oscillating magnetostatic fi eld generated by the whirling magnetization within the domain-wall. 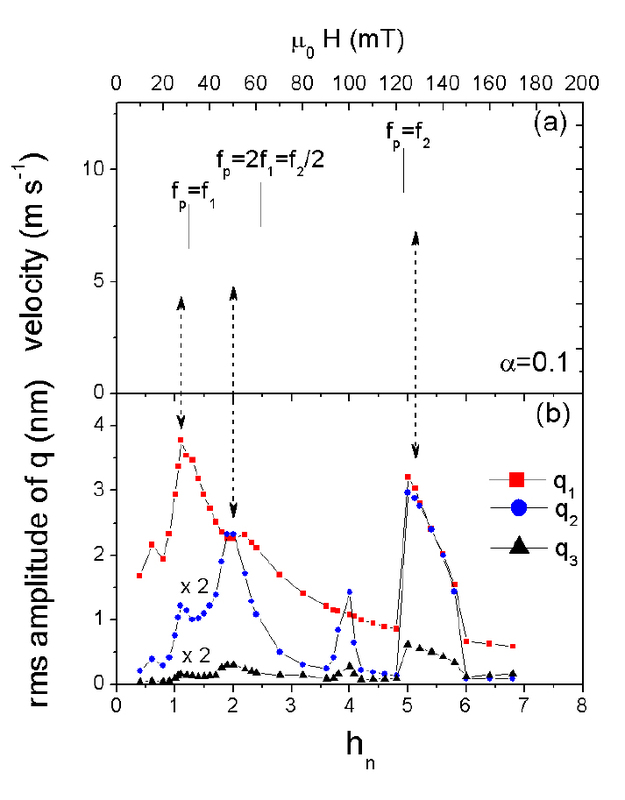 Micromagnetic simulations of the domain-wall propagation : for a weak damping (α =0.1), additional velocity peaks appear at fi elds coinciding with the resonance of modes 1,2,3 observed in the fl exural spectrum of the domain-wall (« q »). Finally, a collaboration with a theoretician from the University of Riga (Latvia) has produced an elegant semi-analytical model describing correctly both experiments and simulations. It not only provides an explicit expression for the eigenfrequencies of a domain-wall, but also predicts the appearance of fl exural instabilities that may lead to velocity peaks. This semi-analytical approach leads to a considerable gain of time compared to numerical simulations. This model was initially developed for GaMnAs, a magnetic semiconductor with conveniently adjustable magnetic properties but a Curie temperature below room temperature. It could now easily be adapted to metals, where high velocities are much sought-after for applications.